The final name in the Ring of Honor Top Prospects set is a wrestler who first appeared in the original Ring of Honor game. Back in 2012 Caprice Coleman was part of C&C Wrestle Factory with fellow North Carolinian Cedric Alexander. After Alexander’s departure from ROH, Coleman went solo for a while before forming a stable called the Cabinet with Rhett Titus and Kenny King, which later became the Rebellion with Shane Taylor. However, after losing a match in June the group was forced to disband, once again forcing Caprice to go at it on his own. 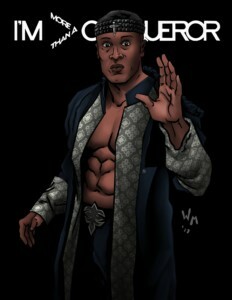 Coleman has embraced his preacher roots and has a popular talk show on ROH TV called The Pulpit. Will this next incarnation of Caprice Coleman be his most successful yet? Caprice Coleman joins Flip Gordon, Jay White, The Kingdom, Kenny King, Todd Sinclair and the Beer City Bruiser in the 8-card Ring of Honor Top Prospects game pack. It is available to preorder right now by going HERE! It is also available in the 2017 Holiday Package deal along with Champions of the Galaxy FTR Set 2, Legends: Expansion Pack I, and 2 Legends SE cards by clicking HERE. Games will begin mailing on December 14th.